A beard is some men’s pride, and it is essential to keep healthy while looking good. If someone has a deficiency in their diet, that may cause hair loss even facial hairs. According to research, men who have a balanced diet enriched with vitamins have good facial hairs. Although genetics and hormones contribute, vitamins are equally essential. Several vitamins are necessary for body functioning as well as promoting facial hair growth. They are vitamin A, C, and B, etc. which are used for beard growth. Vitamin C is present in citrus fruits such as strawberries, oranges, kiwi and pineapple, etc. other foods having vitamin C are kale, papaya, bell pepper, chilies, and cauliflower, etc. The role vitamin C plays in the body is an antioxidant that scavenges the free radicals which generally produce in the body and act as a stress inducer. When free radicals are present in excess, they cause the formation of toxic metabolites in the body, but vitamin C helps to get rid of them. Its antioxidant potential kills those free species and improves the blood circulation. The improved circulation helps to supply the blood to hair follicles. Vitamin A is present in carrots, liver, egg yolk, tomato, broccoli, and mangoes etc. Vitamin A is present abundantly in these foods and helps in the formation and maintaining of epithelial tissues. It also helps in sebum production that is secreted by the skin and moisturizes the skin. Beard vitamins mostly contain vitamin A.
Vitamin E is present in soybeans, leafy veggie, nuts, beans, and seeds, etc. It also antioxidant and helps to maintain skin and hair health. It improves the blood circulation that provides all the necessary nutrients to hair follicles to promote their growth. Niacin containing foods are chicken, pork, turkey, oily fish, peanuts, liver, and strawberries etc. Niacin is a beneficial vitamin for beard growth because it improves blood circulation as well as the production of various hormones. The testosterone hormone is responsible for hair or beard growth, whose imbalance may cause hair loss. But vitamin B helps to balance that hormone and promotes the beard growth. Vitamin B7 (also known as Biotin) is one of the essential vitamins for hair growth. The foods having vitamin B7 are a wheat germ, oyster, egg yolk, bread, and legumes, etc. This vitamin enhances hair growth because it promotes the synthesis of keratin which is a structural protein of hair. 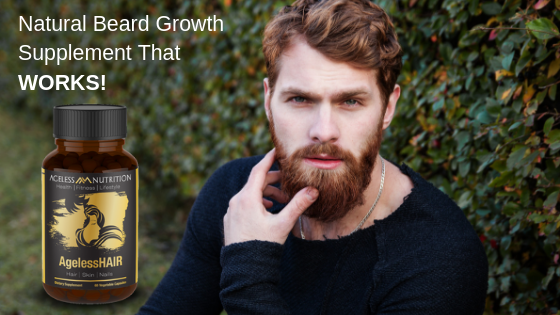 It is a beneficial vitamin for beard growth. Vitamin D can be obtained from sunlight while foods containing vitamin D are liver, nuts, dairy products, etc. Vitamin D promotes beard growth by balancing the hormones and triggers the production of testosterone which is responsible for facial hair growth. Vitamin D can be called facial hair hormone. Vitamin K is a fat-soluble vitamin and present in green veggies, and organ meat such as liver, brain, heart, etc. There are two forms of this vitamin, and they are essential for DHT and testosterone production which promotes beard growth. Other than these vitamins there are some mineral ions which are essential for beard growth such as potassium, sulfur, zinc, calcium, magnesium, and phosphorus etc. They balance the hormones and enhance the androgenic potential of the body which promotes facial hair growth. Some of them are a vital cofactor of enzymes which regulates body functioning while some help in the balancing body electrolytes. If you have reduced beard growth or have facial hair loss, then you might be suffering from some vitamin deficiency. The best way is to get tested or consult the doctor, but most of the time eating balanced food can help to overcome weaknesses. We have a product named as AgelessHair which is very beneficial for skin, hair, and nails. It is enriched with all essential vitamins and minerals such as biotin, vitamin A, vitamin C, Folate, vitamin B, collagen and several plant extracts. This is the best supplement for beard growth, and you’ll love the results. Apart from taking supplements, drink more water to keep the body hydrated along with eating fresh fruits and raw vegetables. A balanced diet is vital for a healthy life and beauty because our body exhibits what we put in it.